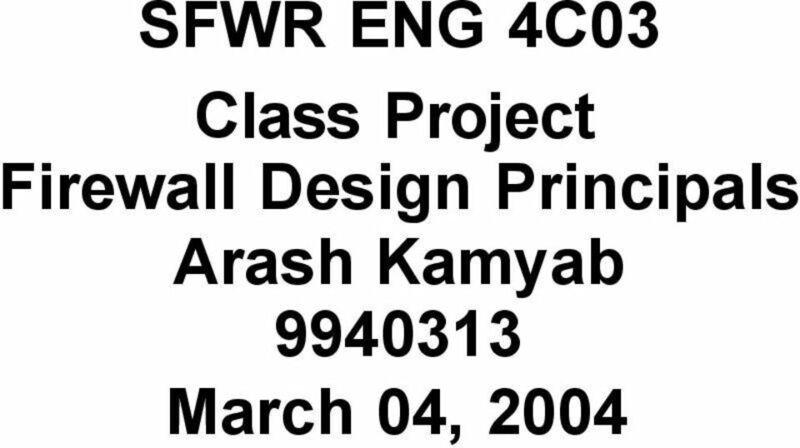 Download "SFWR ENG 4C03 Class Project Firewall Design Principals Arash Kamyab 9940313 March 04, 2004"
3 Firewall Types: The four basic types of firewall are packet filters, circuit level gateways, application level gateways and stateful multilayer inspection firewalls. These types can be used separately or jointly and can be implemented on the same or on different firewall hosts. This report will look at the two most popular types of firewalls; Packet filters and application level gateways. It will also look at the TCP/IP layer on which the filtering takes place for each type of firewall. 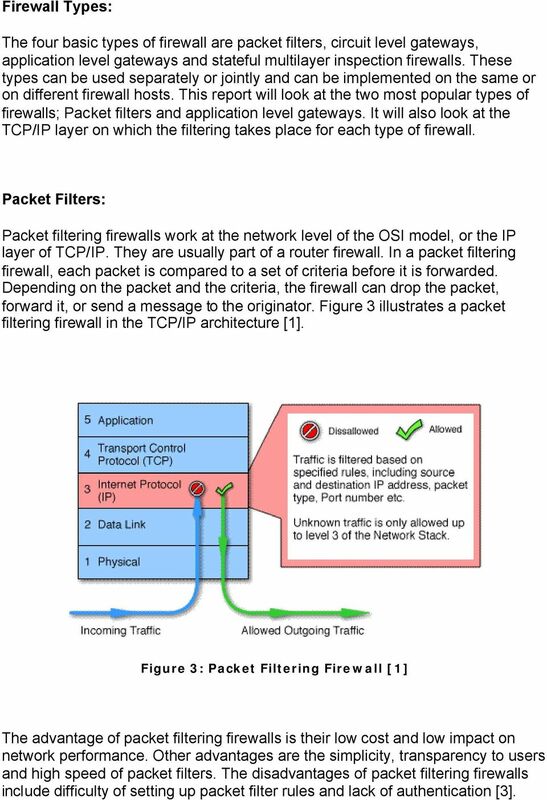 Packet Filters: Packet filtering firewalls work at the network level of the OSI model, or the IP layer of TCP/IP. They are usually part of a router firewall. In a packet filtering firewall, each packet is compared to a set of criteria before it is forwarded. Depending on the packet and the criteria, the firewall can drop the packet, forward it, or send a message to the originator. Figure 3 illustrates a packet filtering firewall in the TCP/IP architecture . Figure 3: Packet Filtering Firewall  The advantage of packet filtering firewalls is their low cost and low impact on network performance. Other advantages are the simplicity, transparency to users and high speed of packet filters. The disadvantages of packet filtering firewalls include difficulty of setting up packet filter rules and lack of authentication .